I know I shouldn’t technically be promoting “competition,” but hey, it’s my web site, right? I’ll do whatever pleases me! And it pleases me to bring your attention to things I think could be helpful. I just noticed that Rob Galanakis has a new book coming out, Practical Maya Programming with Python. Not only is Rob a thoughtful and experienced software engineer, but it looks like the book should cover some great topics that we didn’t really get into in ours for various reasons—PyMEL, PySide/Qt, and aspects of software architecture and design. It’s definitely something worth keeping an eye on! As of today, version 3.0 of my Python IDE of choice, PyCharm, is available! Of interest to Maya developers, they’ve added built-in support for seamlessly setting up Maya’s interpreters. (Previously, on Windows, you had to do some workarounds with symlinks, and on Mac it was simply not possible, to my knowledge). Also interesting to plenty of newcomers out there is that they now have a completely free version, PyCharm CE. If you’re still using Wing or Eclipse/Aptana, it’s definitely worth giving it a whirl. We’ve received notification that the indentation problems on the Kindle version should now be fixed, which seems to be reflected in the Kindle preview on Amazon. Please feel free to share your experiences reading the Kindle version with us. It has been brought to our attention that the Kindle version of the book currently has some serious formatting problems. Namely, some customers have told us that leading white space is stripped out, which of course renders the code samples uninterpretable. Although we (as authors) have little ability to do anything about it ourselves, we have passed this info up the food chain in hopes that it can be resolved. In the meantime, if you have the option, we’d recommend avoiding the Kindle version of the book until or unless it can be resolved. Thanks to those of you who let us know! We’ll be sure to post an update if we find out anything different. 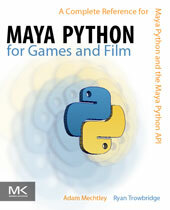 Welcome to the website for our book, Maya Python for Games and Film! We’re really happy to have the project finished, and we’re glad that you’ve either picked up the book or stopped by to check out the web site. We really just want the book and site to be helpful tools for people who are learning all about Python in Maya, so we hope you find it useful! We make no claims that we are the most expert developers where these topics are concerned: we were only ambitious enough to try to write a book to help newcomers to the community. That being said, writing a book is hard, and writing a book about Python is a lot more difficult than we had anticipated! As such, we want to thank our contributing authors, Seth Gibson and Kristine Middlemiss, as well as our technical editor, Dean Edmonds, without whom this project would not have been possible. Have fun and good luck on your journey to master Python in Maya!